Growing up, my house was filled with the smell of baking cookies during the month of December. The Christmas of my childhood has the smell and taste of spritz cookies imprinted in my memory. For several weeks leading up to Christmas, my mom would bake batches of several different kinds of cookies. She stored the ones that didn’t get immediately eaten and would not fit in the freezer outside to chill. One of the dearest family traditions was heading across town to grandma and grandpa’s house on Christmas Eve for cookies and cheeseball. My family, aunt and uncle, cousins, and grandma and grandpa would eat and open presents—and every year, without fail, the gift from the grandparents was a wad of cash, wrapped inside an old check box. This tradition felt as meaningful, if not more, than the other traditional festivities on Christmas Day. As an adult, I’m no stranger to living abroad and being away for the holidays. This Christmas in China was the 5th time (in 4 different countries) in my life I’ve been out of the country to celebrate, and each time I have had a unique experience. As a Peace Corps Volunteer, I am present to teach English and live out cultural exchange. So it felt natural to invite some students over on Christmas Eve for cookies and gifts. Like my mom, I spent several weeks ahead of time baking (small) batches of cookies. Unlike my mom and grandma, however, I had limited access to supplies here in southwestern China and ran into quirks using a heavier sugar and my small toaster oven. But oh, did those cookies taste good anyway. In all, we ate out fill of cookies, snacks, fresh baked pumpkin scones (my new tradition), chili (made by another foreign teacher), and hot cocoa. I orchestrated a white elephant gift exchange and introduced the students to the concept of a party where people just chill out. My grandparents have both since passed away, and I’m out in the world far from family–yet the tradition still lives on. I’m so grateful for the opportunity to share tradition, home, and hospitality with this wonderful group of students. The apartment, ready for the party. Enjoying the gifts and food. Participating in a gift exchange. It is now past the middle of February, but here is a story from last Christmas. 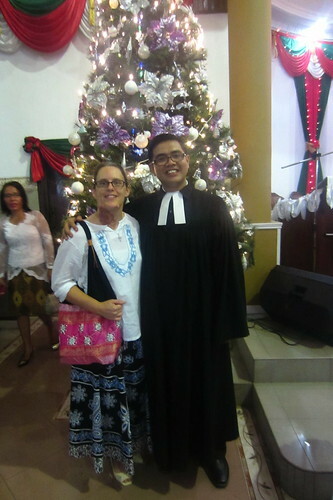 For Christmas 2014 I had the opportunity to be with my brother in Indonesia. To the Western audience it must be said that I don’t actually have a brother in my immediate family–this brother is my Indonesian family, and I am his sister. The family system of the Batak Toba culture is more complex than in Western cultures. It is seen not only in how people are addressed in daily situations (the words for mother, father, sister, brother, uncle, aunt, grandmother, and grandfather), but also at a deeper level. The Batak people have distinct family surnames that are grouped together by ancestral line, which sets them apart from some of the other cultures within Indonesia (many Javanese have only one name). Those Bataks with surnames in the same ancestral group are family, and subsequently prohibited by culture to marry each other. To the Western ear it may ring as a bit harsh, but this is how they have kept true to their ancestors. They know when they meet a person in their group, that they really are family. Given this importance, it has never been nor will it ever be a custom for the woman to change her name in marriage; her family name is of higher importance. What does this have to do with me? Because there is great pride in their culture and to share about it, some Batak people love to invite others into their family. I posted previously about preaching at a church, and the pastor and I have been close since. His surname is Lumbantobing (or just Tobing for short), and because he asked me, I am also boru Lumbantobing. It makes me think about family and naming, and what those mean. My family now extends far beyond my own blood and borders of my country.